Ooops. It appears that I got it wrong and that Bo Innovation Hong Kong was demoted to a one-star in the 2010 Guide which I think came out in December. 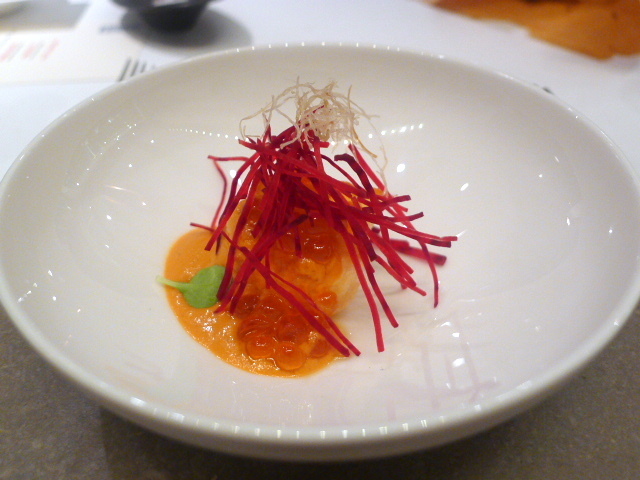 Bo Innovation Hong Kong is a two-star Michelin restaurant, and the 65th ranked restaurant in the 2010 San Pellegrino’s Best Restaurants in the World list. The ‘World’s Best’ website describes Bo Innovation “as a ground breaking Chinese fine-dining restaurant, serving ‘X-Treme Chinese’ cuisine, with executive chef Alvin Leung known around the world for his sense of adventure, humour and rock and roll”. Bo Innovation is known for its molecular reinvention of traditional Chinese and I was certifiably curious. I grew up eating Chinese food, and I’ve had molecular gastronomy many times over, but never the two combined, so this was going to be my first foray into this new dimension. The restaurant is modern and sleek. There are no traditional Chinese touches here, no red lanterns or the like. Instead there are bare floors and industrial looking walls. The only hint that this might be a Chinese restaurant is the occasion splash of marble. There are three menu choices at Bo Innovation. The standard tasting menu offers nine course,s including a choice of main from five options, and is priced at HK$780 (about £62). 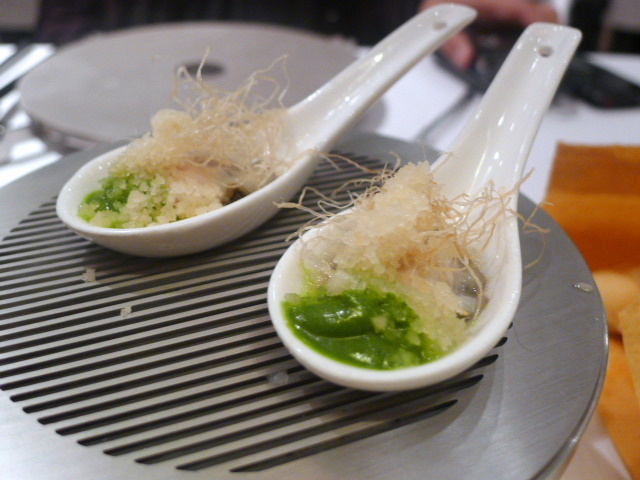 We selected the ‘Chef’s’ tasting with 14 courses which is priced at HK$1,280 (about £102). 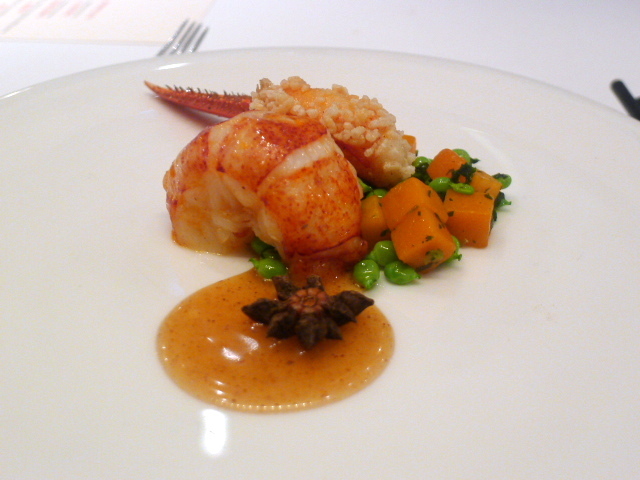 There is also the ‘Chef’s Table’ menu with 16 courses which is priced at HK$1,680 (about £133). 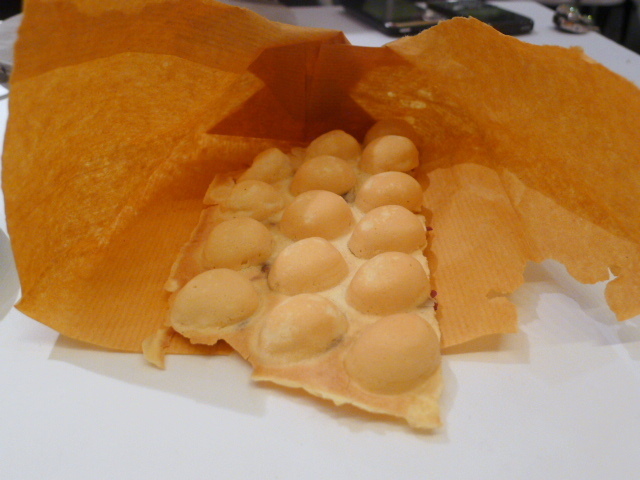 Although bread is typically not served with a Chinese meal, as a substitute for bread (so explained our waiter), we were offered ‘egg waffles’ with Iberico ham. Made from waffle batter and cooked so that they are shaped like little eggs (hence the translation to egg waffles), this is a variation of a typical Hong Kong street food (which I recently discovered being sold in London’s Chinatown). A childhood favourite of mine when I use to live in Hong Kong, it tastes slightly sweet. The use of Iberico ham added a touch of savouriness to the waffle and was very tasty. 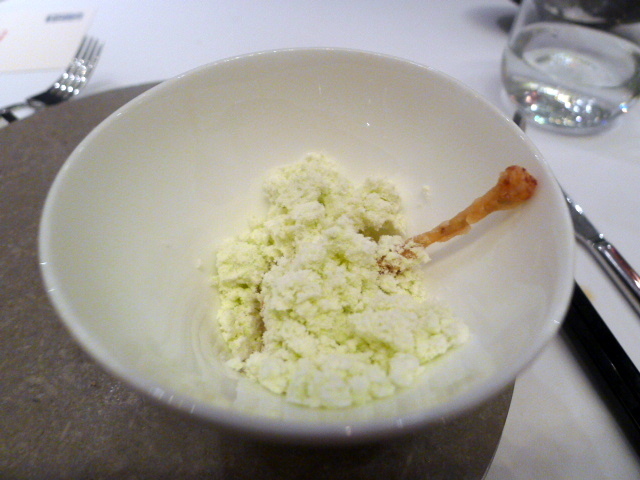 The amuse bouche was an oyster with spring onion, lime emulsion and ginger snow. 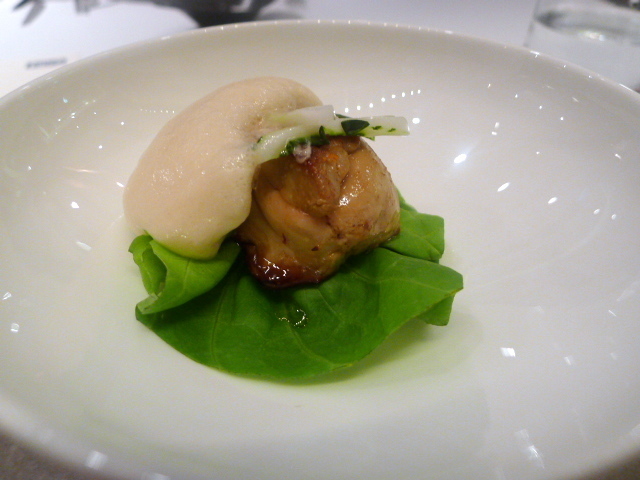 The oyster was meaty and flavoursome, and there was a nice contrast of flavours from the lime and ginger. A variation of ma po tofu was made with red pepper, pine nuts, chilli oil and salmon roe instead of the usual minced meat. The tofu was silky and velvety with a nice crispy skin, and the red pepper worked well with the hints of chilli. ‘Har mei’ is dried shrimp, and in the next dish, a har mei powder and har mei oil had been created (using various dehydration methods) for a handmade lo mein dish. The flavours of the powder and oil were very authentic. 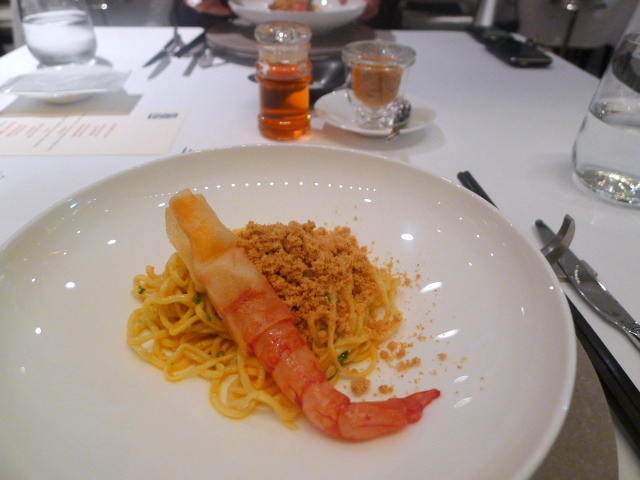 The noodles were well cooked, and were accompanied by a half raw, half cooked wonton Carabinero prawn. 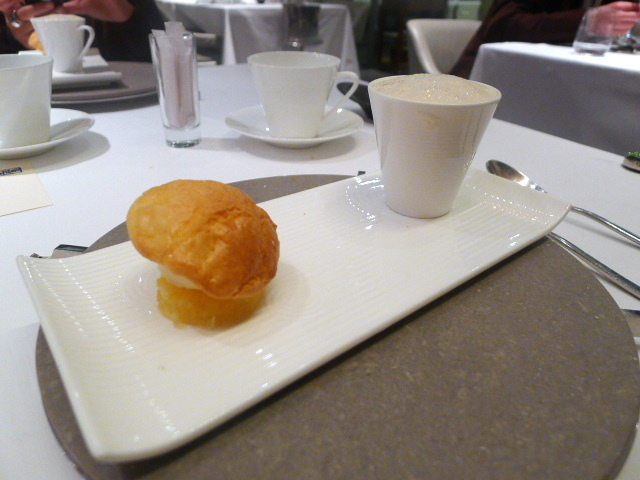 The wonton half of the prawn was also flavoured with a ‘prawn stock’ mayonnaise which worked well with the prawn. While this was a good dish conceptually and very tasty, it was flawed for the fact that I found a piece of hair in my noodles. The tail end of the prawn had not been de-veined properly either, two types of errors which in my opinion aren’t acceptable in a two star Michelin restaurant. Foie gras ‘choy’ was the next dish, a san choy bao containing a meltingly tender piece of foie gras, pickled bok choy and pickled cabbage foam. It was a little cumbersome to eat, but it tasted wonderful with all its rich, silky flavours and unctuous textures. A wonderfully fat and tasty piece of lobster was finished with star anise butter, spring vegetables and pickled cabbage, but was followed by a rather dull dish of pea shoot cappuccino with a side of whitebait coated in pine nuts and almonds. The strong pea shoot flavour also overwhelmed the subtly of the whitebait. A variation of beggars chicken turned out to be a deep-fried frog’s leg which had been topped with a lotus leaf powder. The frog’s leg was wonderfully crispy, and the powder was light and airy. 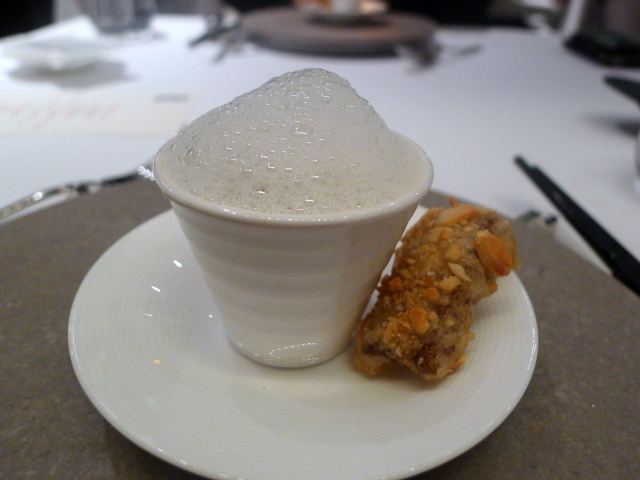 Next up was the Bo Innovation signature dish – ‘xiao long bao’. Xiao long bao is a Shanghainese classic soup dumpling, and here it was reproduced in a ‘molecular’ format, as a jellified ball filled with a ‘xiao long bao’ tasting liquid. This concept is not new – I had something similar at Spondi, a two-star Michelin in Athens. 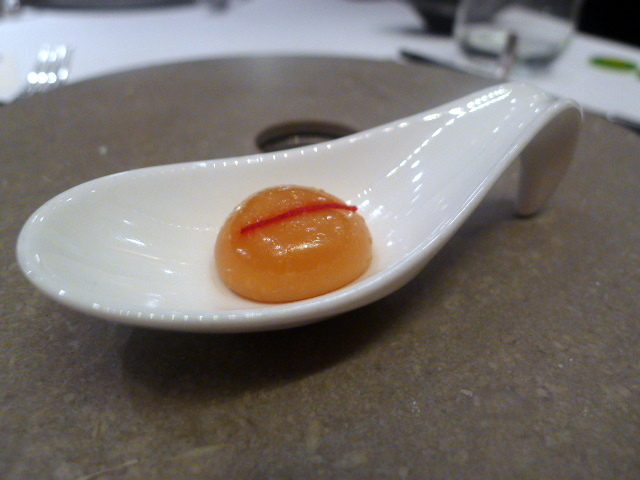 There, I tried a jelly ball with a Greek salad-tasting liquid centre as one of the amuse bouches. Bo Innovation’s version was highly authentic in taste so as to warrant praise. 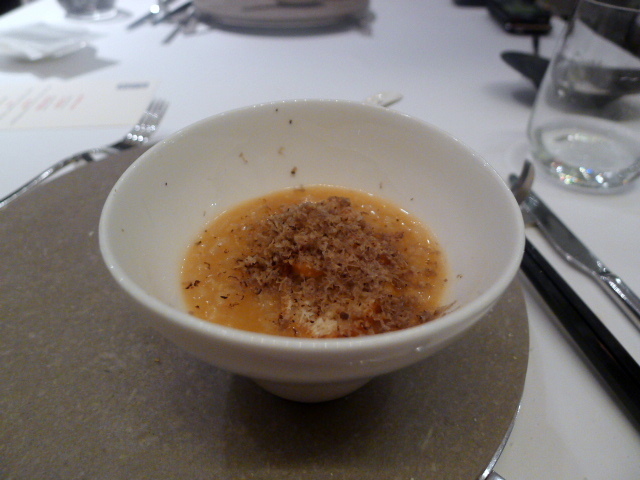 Congee lobster with black truffle was very well made with a heavy flavour of lobster stock. I enjoyed this, but I must confess that I prefer more traditional congees such as ones made with pork and preserved 100-year old eggs which taste less ‘fishy’. The congee was followed by a lovely piece of delicate cod which unfortunately was overpowered by the very strong flavour of sea urchin. 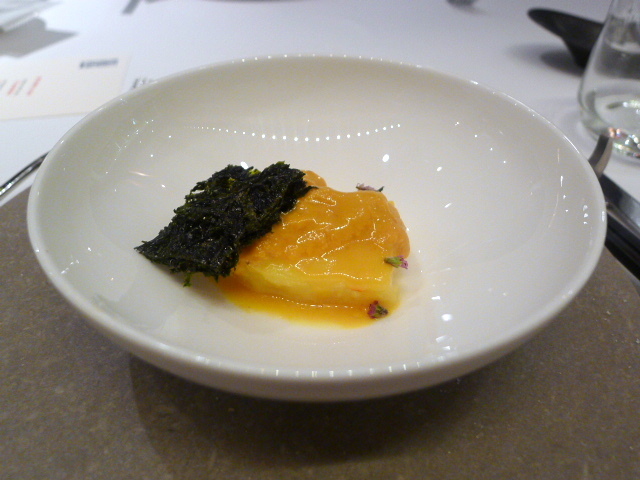 It was accompanied by white miso, sauternes and some fantastically crispy seaweed. 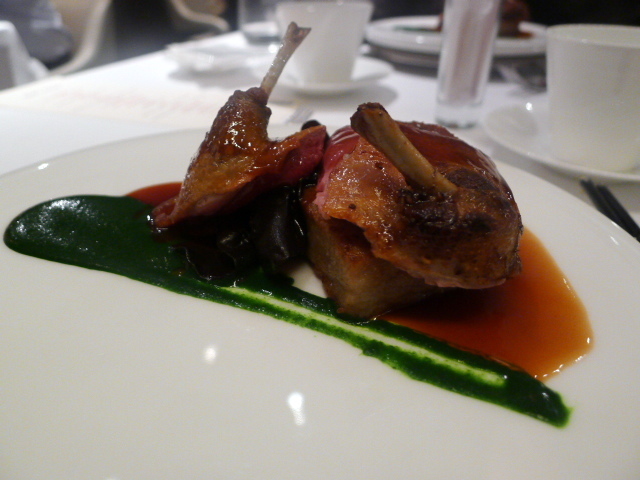 The meat dish of pigeon was served blue, rather than the promised medium rare. It had been cooked sous vide, so it was hard to fathom why an error of this sort arose, and we were not the only table to have to send the pigeon back. Disappointingly, the pigeon was overcooked the second time around. It was served with wood fungus, choy sum purée and a divinely delicious shiitake rice cake with delectable nutty overtones. 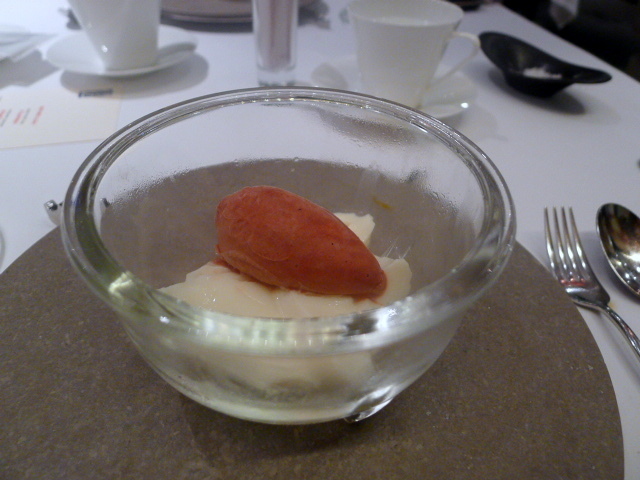 A pre-dessert of traditional Chinese (set) almond pudding and hawthorn sorbet was designed to replicate the smell of ‘the inside of a temple’ with the use of sandalwood smoke (the smoke had dissipated by the time I took the photo). A clever dessert, it was quite tasty, although the sourness of the sorbet was a little strong when eaten with the velvety subtle tones of the pudding. Dessert was a pineapple bun with a pina colada. To explain, a pineapple bun is a typical and popular baked good that can be found in most Chinese bakeries. It’s a circular bun topped with a crunchy sweet crust made from pineapple and sugar. This was a deconstructed bun, ‘constructed’ from a slice of pineapple, vanilla ice cream and the topping of pineapple and sugar. This dish was tasty but unspectacular. 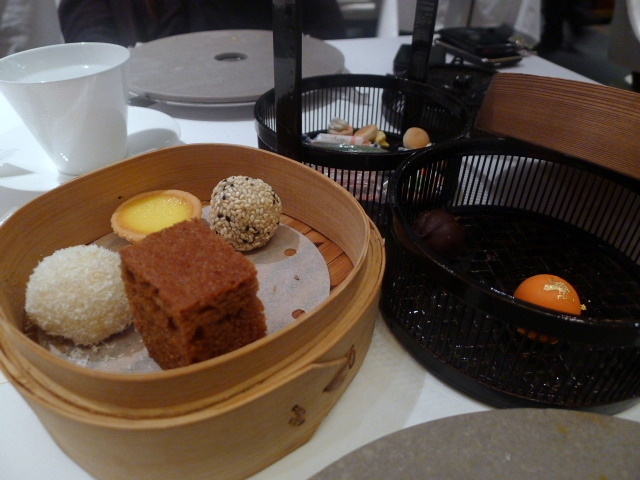 The petit fours came as a selection of ‘petit dim sum’, a variety of very well made sweet treats made to look like traditional dim sum. Cleverly presented, there was also a range of tasty chocolates. Bo Innovation delivered a well cooked Michelin meal with some wonderful flavours. The service (available in English) was also reasonably polished. That said the food didn’t particularly captivate me as being dizzyingly innovative. I enjoyed the food enough to not regret going. It was for the most part excellent. But I suppose I’ve been to enough ‘molecular’ restaurants to not find Bo Innovation particularly distinguishable from the rest. It failed to arrest my imagination. There were some strong molecular elements, but courses such as ma po tofu felt less molecular, and more like a dish of ingredient substitution. It was also hard to grasp some of the basic errors that we saw given the restaurant’s two stars. To make matters worse, having our noodles (with hair) and (raw) pigeon dishes replaced seemed to throw out the restaurant’s service times. The consequence of this was that the food service was uneven, and our meal lasted at least 45 minutes too long. Given that this was a 14 course tasting menu, you can probably understand why I felt exhausted by the end of this elongated experience. There’s no doubting the cooking at Bo Innovation is pretty sound, and the wonderful quality of ingredients that we were served certainly justified the HK$1,280 price tag. But would I want to spend the money again? Well, probably not. And when I take into account the mistakes, and the fact that there are so many great, affordable places to eat in Hong Kong, it’s hard to recommend Bo Innovation over another restaurant in Hong Kong, even if it has managed to corner the market in molecular Chinese food. Like I said, I have no regrets about going. But as far as two star Michelin restaurants go, I’m lukewarm on this one. Prices listed above. Excludes drinks and 10% service. I am glad you enjoyed the foie gras dish. Thanks for the vicarious visit- it looks like there are some lovely touches to the meal- as for the hair in the noodles. Gracious me. Yep the hair wasn’t good. just one small thing – wasn’t Bo innovation demoted to 1* in 2010 or am I smoking something amazing? You are right. All the research I had done originally pointed to it being two stars, but Bo Innovation did get demoted. Well it seems I am in agreement with the Michelin guide. I didn’t think that this was a two star meal at all! I lived in HK for 3 years and owned a wine business there. The best Chinese restaurant i ate at is named Fook Lam Moon in Johnston st, Wanchai. Famous for their shark fin and seafood dishes. Thanks for the tip. I will be sure to try Fook Lam Moon next time I’m in Hong Kong.